• The East or bridge side, which can hold up to 120 people in a banquet style seating if desired. • The entire building with banquet style seating for around 180. Each side has a stainless steel serving counter and a sink with hot and cold water available for use. The facility comes with the appropriate number of tables and chairs located in storage rooms on either side of the facility. A garage door separates the two sides. Men’s and women’s rest rooms are located on the east side of the building with access from the outside of the building and are available to the general public using the trails or park. Windows open easily for great ventilation and an enjoyable view of the park and river. Ceiling fans will help move the air in an effort to keep the inside of the building cool on the hot summer days ahead. A small deck/patio is available with the respective ends on the river side of the building. 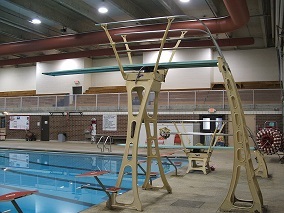 Rentals can be made up to one year in advance in person at the Cedar Falls Recreation Center located at 110 East 13th Street in Cedar Falls. Those interested in inquiring about available dates can call the Rec Center at 319-273-8636 to obtain that information. The following is the current rental fees and deposits. A deposit check of $500.00 is required for east side or $750.00 for the rental of the entire building. 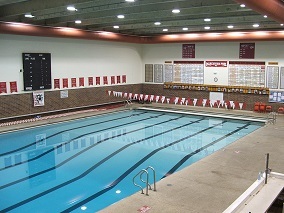 You may pick up your electrical key at the Rec Center up to 36 hours in advance of a rental and leave your deposit. Deposits can be picked up 3 business days after your rental if no damage is done and your KEY IS RETURNED. Please remember the park, and thus the building by ordinance, closes at 10:30pm so plan accordingly. Must be at least 21 years of age to rent the facility. Understand the facility can only be used from 8:00am thru the park closing at 10:30pm. Understand they are responsible for picking up all refuse and removing all bags of trash by closing time the day of the rental and placing it in the dumpster provided. Understand that they may NOT use any form of tape, nails, hooks, thumb tacks, staples, sticky tacky substance or like products on walls, windows, doors, ceiling, or fans. Understand they may not enter the building before 8:00am, store items overnight either before the rental or after the rental and must remove all items by 10:30pm. 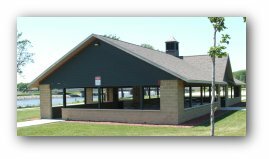 Reservations for the any Cedar Falls Park Shelters are taken at The Cedar Falls Recreation Center, 110 E. 13th St, Cedar Falls. You must be 21 years old to rent the facility. Keys/Deposit IF your park has electricity, you may pick up your electrical key 1 Day prior to your rental and leave your deposit. Your deposit can be picked up 3 Business days after your rental if no damage is done and your KEY IS RETURNED. Reservations for the the Gateway Celebration Shelter are taken at The Cedar Falls Recreation Center, 110 E. 13th St, Cedar Falls. The shelter is located at Gateway Park on N. Main & 1st St. Detailed information about Gateway Park. A deposit check of $250.00 is required. You may pick up your electrical key at the Rec Center up to 1 Day in advance of a rental and leave your deposit. Includes: Cake & Punch, 2 hour available time slot in the Multi-Purpose Room and FitGym. *The main gym is closed to youth Monday, Wednesday, and Friday from 11:00am-1:00pm for adult drop in use. The FitGym is available for youth at this time. Applications to use the Cedar Basin Band Shell may be Picked up at the Rec Center. Must be at least 21 years old to rent the facility. May not be used for a profit making event. The park closes and you must be out of the park at 10:30pm. Please allow up to 14 days after form submission before a decision will be made on your request. Anyone planning on having amplified music must get a noise variance from Cedar Falls Police Operations, which can take up to one week to receive. Keys/Deposit You may pick up your electrical key 1 Day prior to your rental and leave your deposit. Your deposit can be picked up 5 Business days after your rental if no damage is done and your KEY IS RETURNED. Fees for a 1 or 2 day tournament require a $250.00 damage deposit. 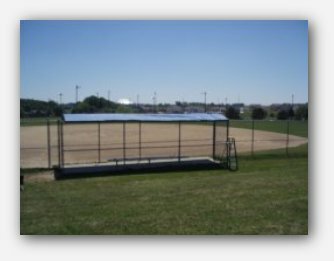 Ball fields are available for AS IS Rentals for practices. Diamonds are prepared at various times throughout the day for Recreation Center Leagues, stay off infields that are game ready. All party dates and times are based on availability. We recommend you book a date at least several weeks in advance. Once you have booked your date - you will have 48 hours to pay your fee in full.